At 6:20 a.m. on Tuesday, Oct. 21, my clock radio awakened me in my home in the Bronx to the radio announcer saying, “Giants and Royals in Kansas City tonight. Game one of the World Series.” “I am dreaming,” I thought. When I realized I wasn’t, I jumped out of bed to call my Abba so we could share our exuberance about the ultimate Margolies World Series. His lifelong beloved Giants and his much-loved Royals. 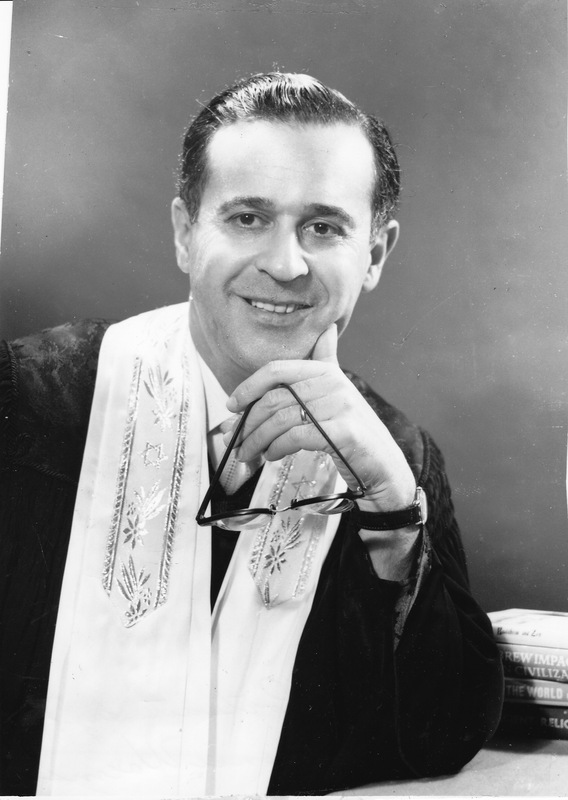 Then I truly woke up; my father’s second yahrzeit (anniversary of his death) was rapidly approaching. This World Series was dreamt up in heaven, by my father. My father’s passion for baseball began shortly after he arrived from Jerusalem in January 1930 at the age of 8, with his mother and siblings, to join his father who was already living in the Bronx. He spoke no English, only Hebrew, and Yiddish. But he quickly learned the language of baseball. However, as there were then three New York teams — the Yankees, Dodgers and Giants — he didn’t know for whom to root. The problem was solved when a Salanter Yeshiva classmate told him the only Jew on the three teams was Harry Danning, a catcher for the Giants. That was all this little boy, born in the ultra-religious section of Meah Shearim and desperately trying to acclimate to America, needed to know. Danning was a Jew, and to a wide-eyed boy from the backwaters of 1920s Jerusalem adjusting to a new life, this fact connected him to the world he just left. 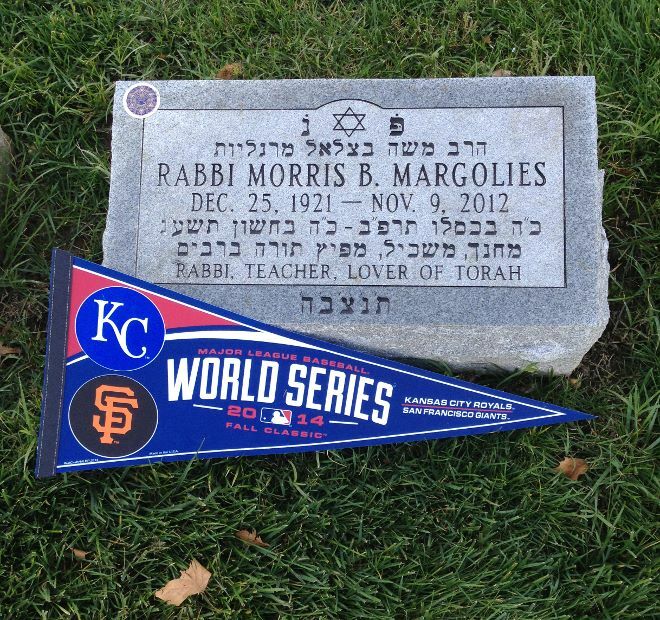 The Giants became his team and his love for his Giants never waivered even when they left New York for San Francisco and we left a few years later for Kansas City. It was in fact through baseball that my father claimed to have received his best childhood advice ever. He told the story of how one yeshiva classmate, Josh Rednor, helped him make friends when he still barely spoke English. Josh told him that to become buddies with the other kids all he had to do was ask each one who was the greatest baseball player of all time. If someone didn’t know, Josh told him to simply say “Ty Cobb” and then he’d fit right in. And so he did. Perhaps too well. According to my father, his father — the grandfather I never met — a rabbi and Talmud teacher at Salanter Yeshiva, thought my father’s obsession with baseball, which only increased over the years, was a waste of time, taking away valuable hours from Talmud study. As a teenager, in what proved to be a futile attempt to convince his father of the wonders of baseball, he took him to a game. After someone hit a home run, my grandfather turned to my father and said in Yiddish, “So what has he accomplished? He started out at home plate and he ran all the way around to get right back to where he started.” That was the last baseball game my grandfather ever attended. 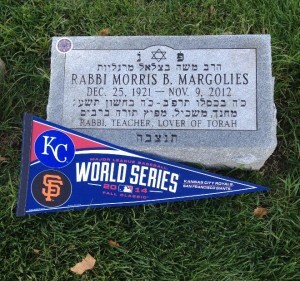 But to my father, baseball fit quite well with Torah and Talmud. After all isn’t Simchat Torah about completing the Torah reading only to immediately start back at the beginning, at home plate? Indeed, my father fused his passions and turned baseball into a vehicle to promote his greatest love: Torah. His knowledge of Tanach and Talmud was encyclopedic. But so was his baseball knowledge, workings its way into many a sermon. His idea of entertaining his children and grandchildren was to quiz us on the Tanach, and the creativity in his questions would put Jeopardy writers to shame. He combined his knowledge to create a “Torah and Baseball” quiz, mostly for the benefit of my nephews who, like their grandfather, have an encyclopedic knowledge of the sport. He would pose a Torah question and if the right answer was given he would follow up with a baseball question. When my father died in 2012, just days after his Giants won the World Series, I could not help but wonder who won the World Series in 1921, the year he was born, and so I looked it up. Sure enough, the Giants. Strangely, this brought me some comfort that he came into this world and left it with his Giants on top. I will never know which team my father would have rooted for in the 2014 World Series. However, I am certain that he would have loved every pitch, every catch, and every play — and he would have used it all to continue doing what he loved most, teaching Torah. This is a guest posting from Malka Margolies, daughter of the late Rabbi Morris Margolies. She lives near New York City. This was first published in the Kansas City Jewish Chronicle. What a wonderful story, Malka! Thanks so much for sharing it. Malka, I never knew Jonny and Danny had a sister until I read this. I remember your brothers from Camp Massad in the 60s. They were both terrific softball players and nice guys and they must have inherited your father’s love of sports (including ping pong). I’m a retired lawyer now so have time to look up people from my past. Please send them my regards. Yes, Ken Cohen, my brothers Daniel and Jonathan (as I call them) do indeed have a baby sister. I also went to Massad Aleph albeit only for two years back in the early 1970s. I will pass along your regards. Are you a New Yorker?